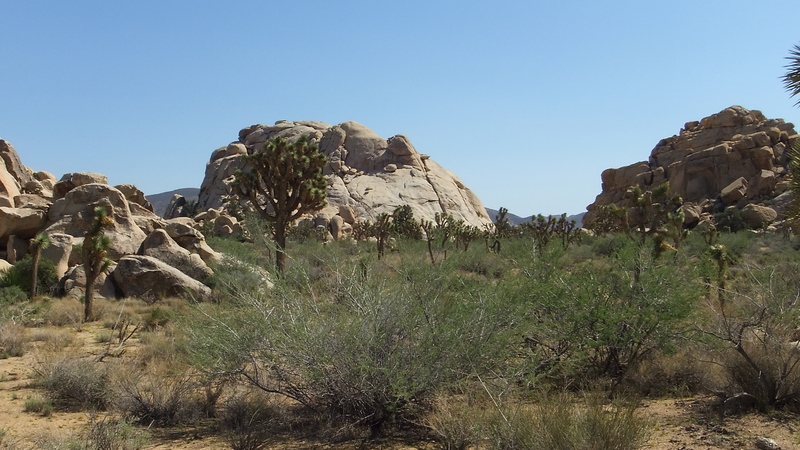 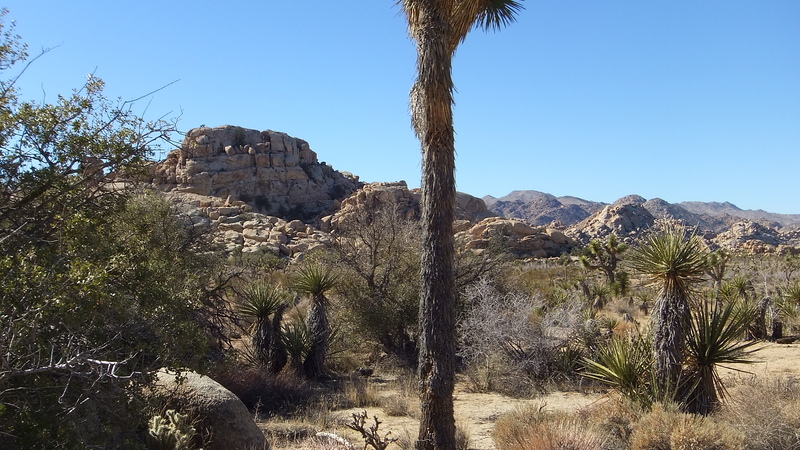 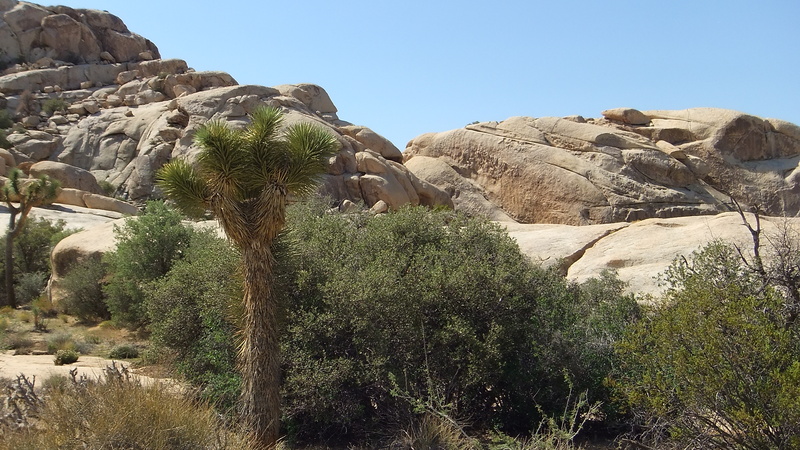 THE CANDY BAR AT JOSHUA TREE NATIONAL PARK is located between Hidden Valley Campground and Barker Dam. 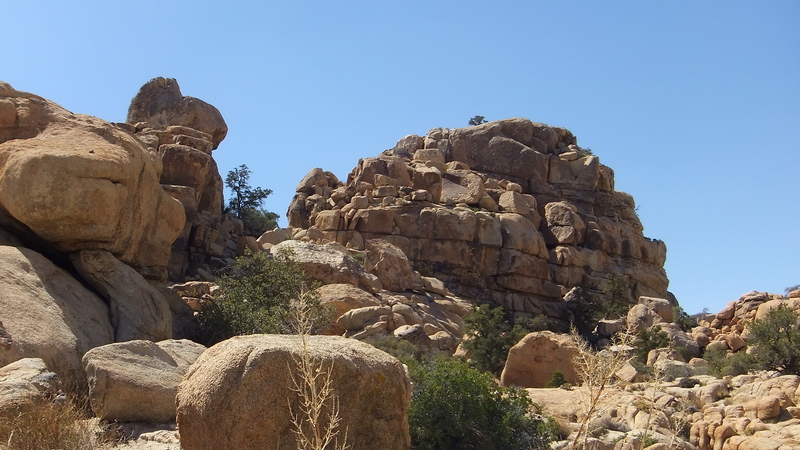 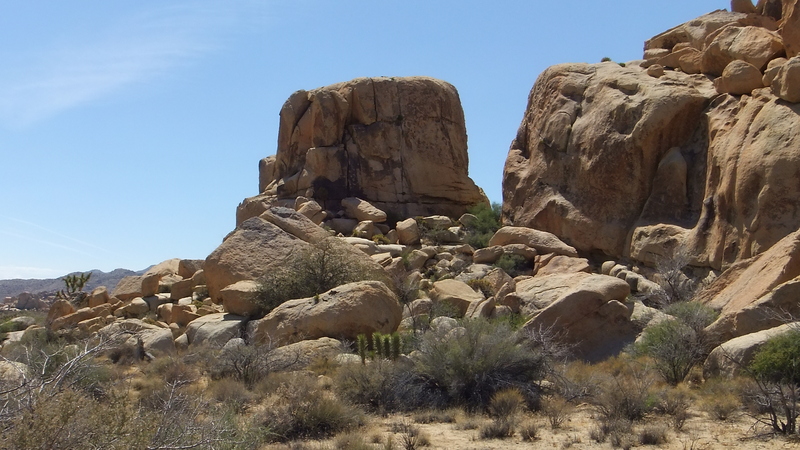 It offers the visitor varied terrain, the usual jumble of oddly named ages-old granite rock-climbing formations, some shade trees, and views every which way. 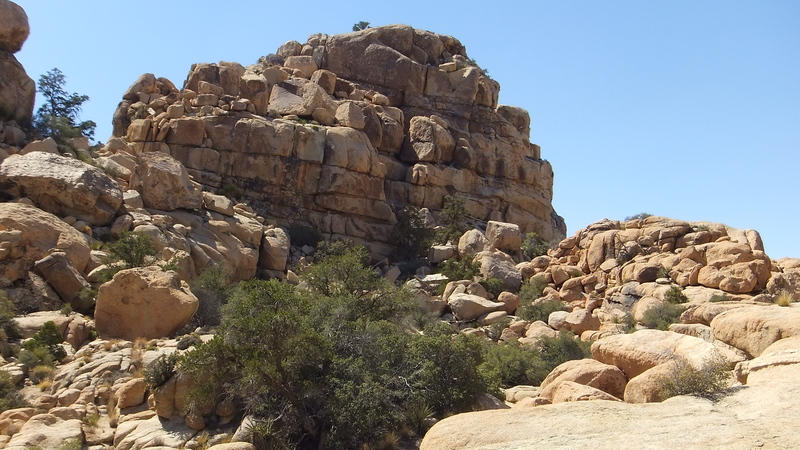 A short stroll up some of the sloping rocks provides a much better appreciation of the surroundings. 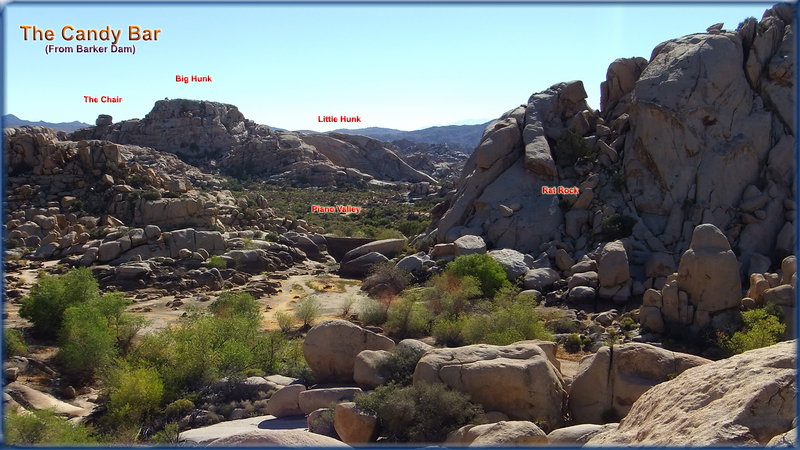 The short southern approach can be made from any of several turnouts along Bighorn Pass Road (the road leading to Barker Dam parking lot). 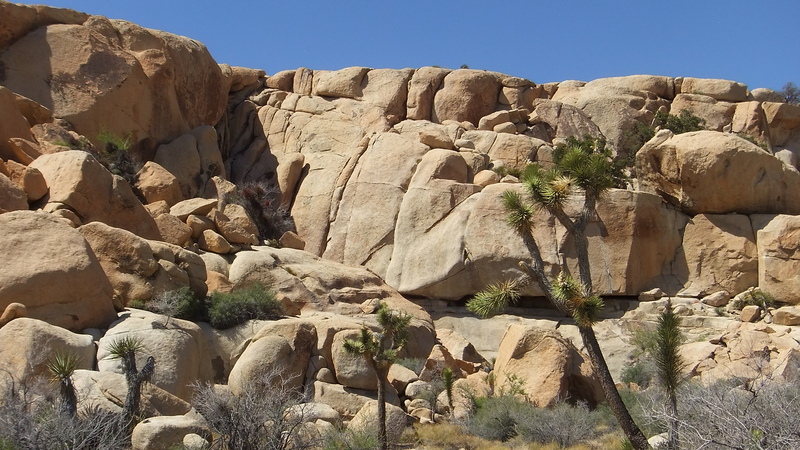 The exterior from this angle is dominated by Snickers. 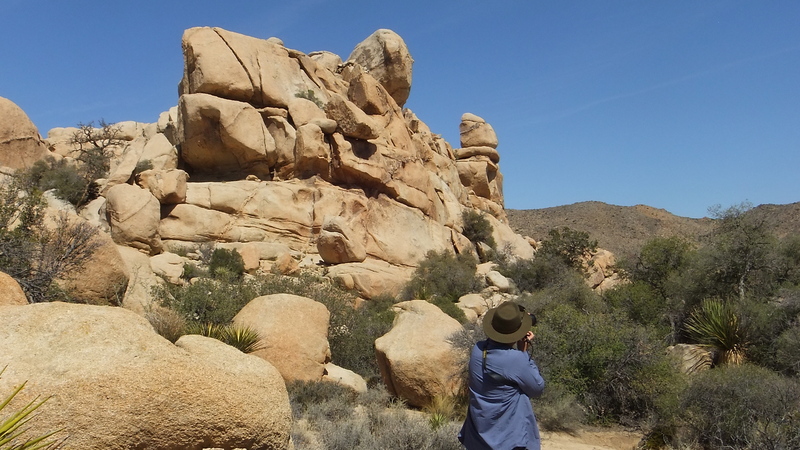 At Snickers’ western end rises a squarish companion block known as Little Rock Candy Mountain. 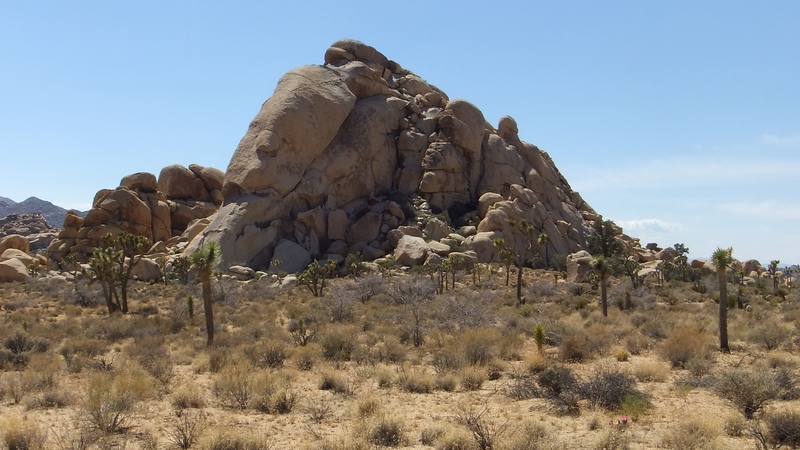 Behind Snickers, and visible from the road, jut portions of the interior including The Chair that sits atop Little Hunk, and towering over all, the Big Hunk massif. 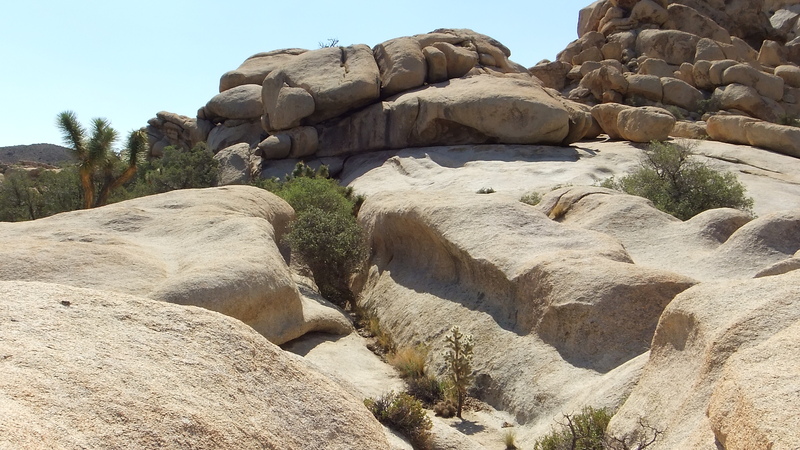 On Snickers itself, there are some features you will notice at once. 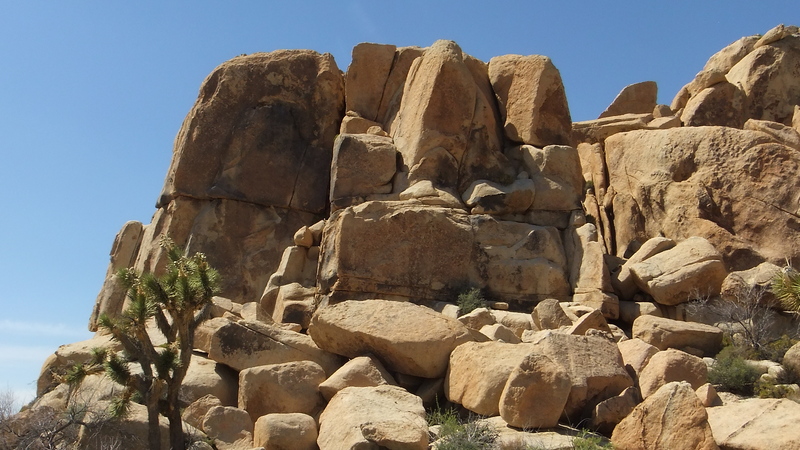 Several obvious large boulders sit on ramps to the right of a vertical gash or corridor. 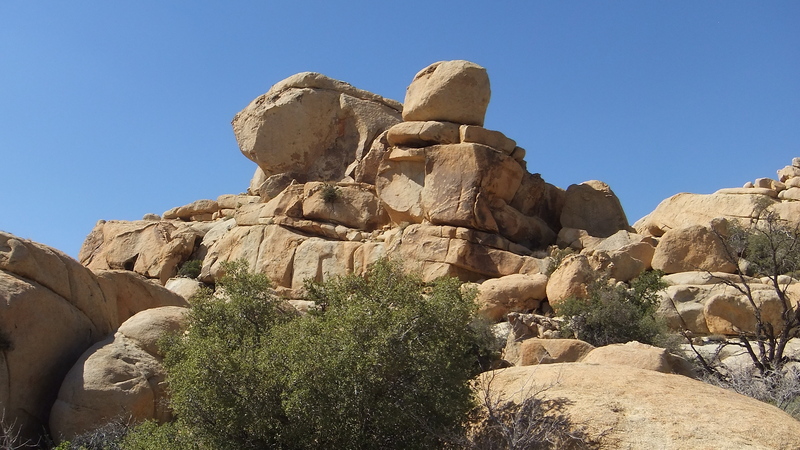 The boulders are known as Sweet Ginger Boulders, with routes “Sweet Ginger,” “Sweet Eternity,” and “The Art of Deception,” all of them difficult. 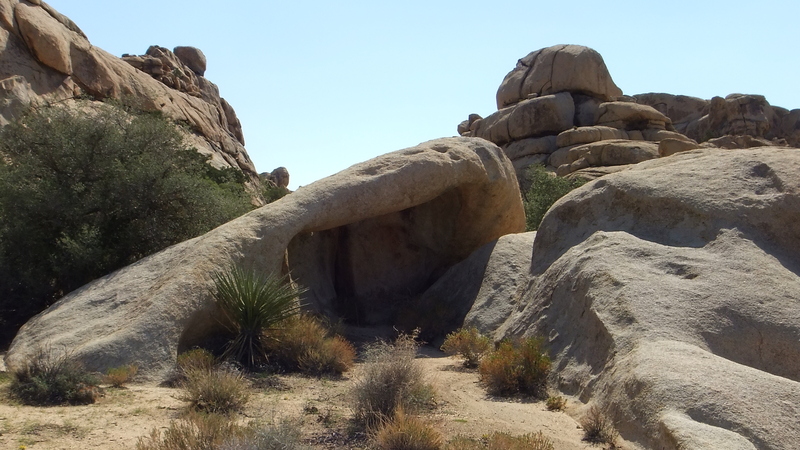 Entrance into The Candy Bar interior can be reached between the formations, with Snickers on the left and the Sun Bowl boulder high on the right. 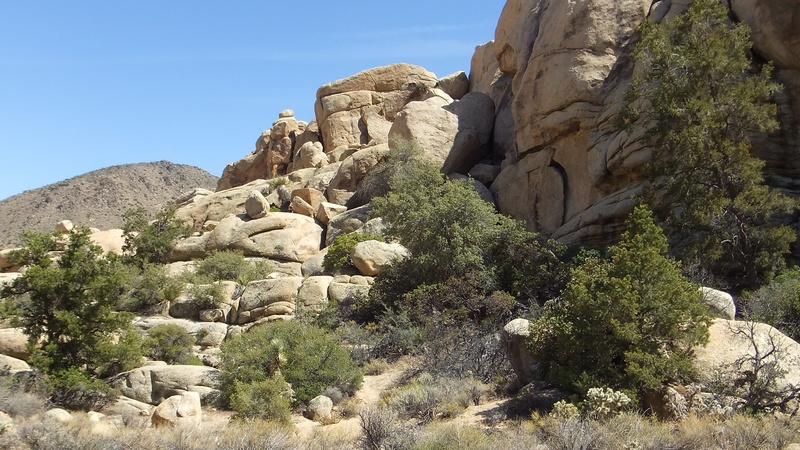 It is also possible to approach The Candy Bar from Echo Tee parking lot, which serves Echo Cove, Echo Rock, The Outback area of Hidden Valley Campground. 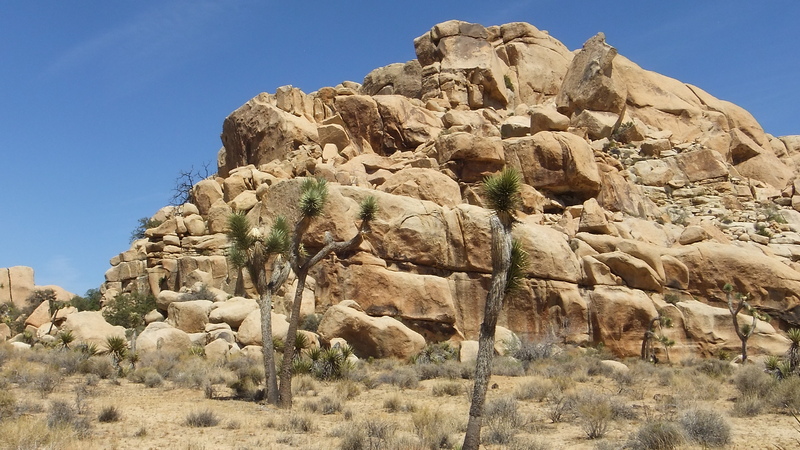 However, if you have parked at one of the Bighorn Pass Road turnouts, once you round the southwest corner of Little Rock Candy Mountain, a wide expanse opens up along this side of Snickers. 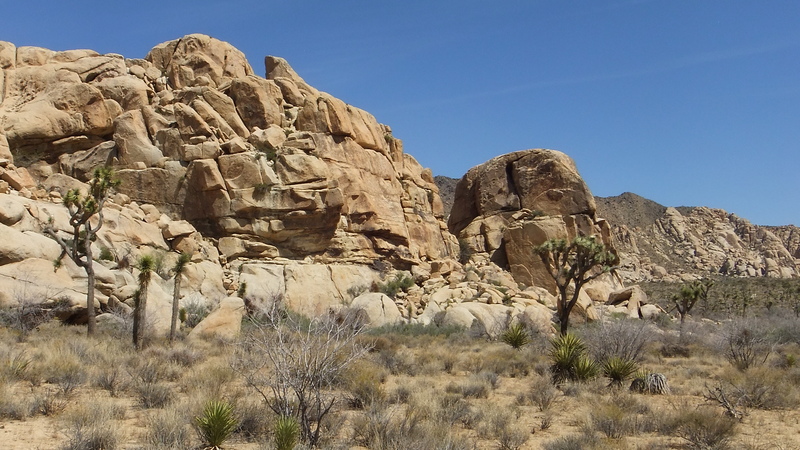 On the left rises Echo Rock. 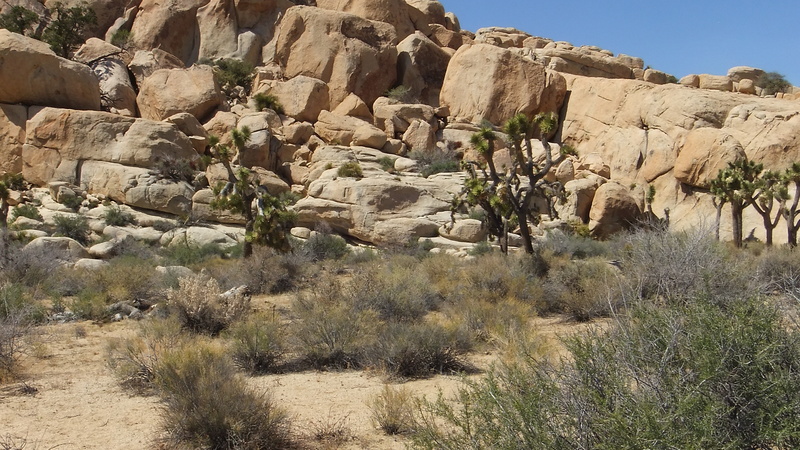 Beyond the western front of Snickers there is an opening into the interior portion of The Candy Bar. 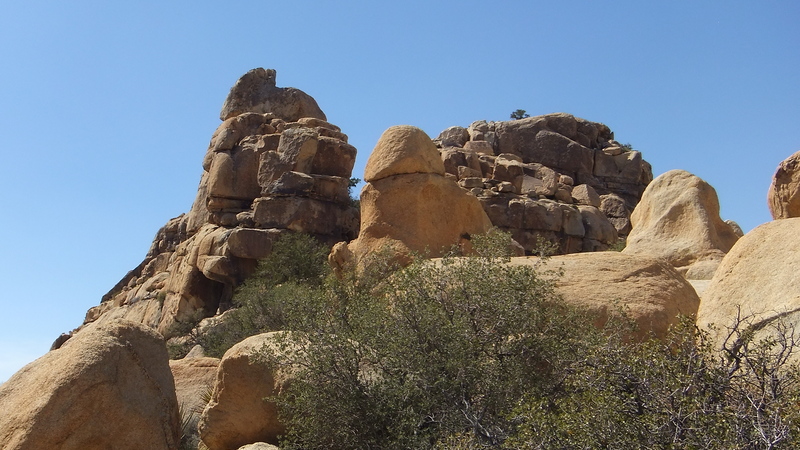 Further left, though difficult to separate in the mind because these lie close together, are Little Hunk, Big Hunk, and Mounds. 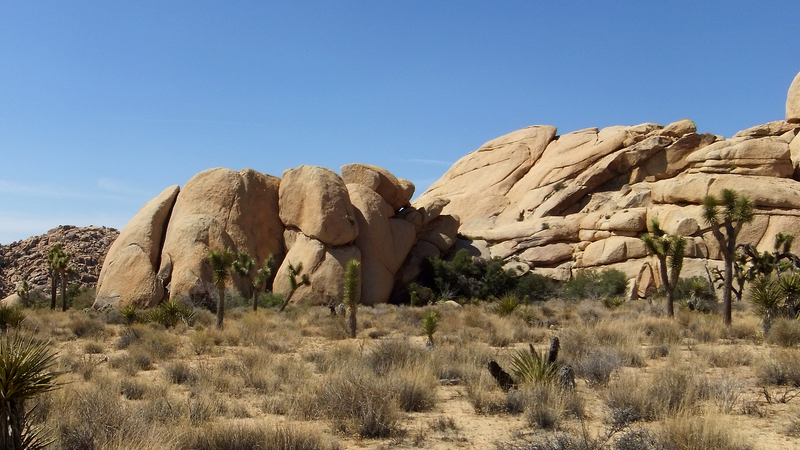 Little Hunk is a very long formation and seemingly the largest of The Candy Bar formations. 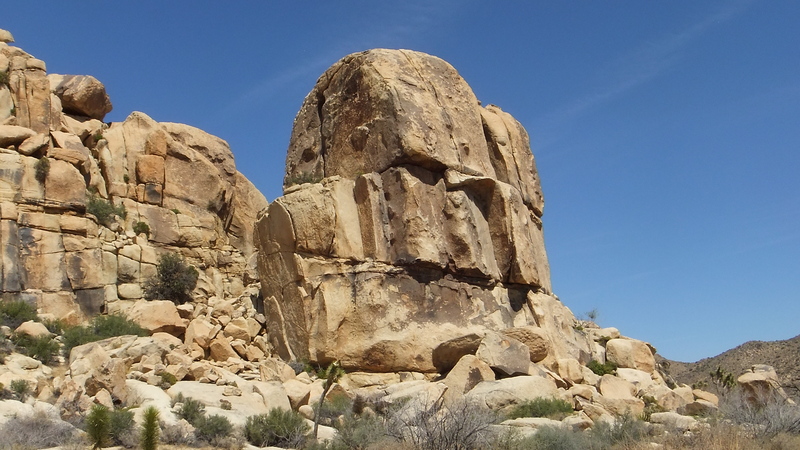 Sandwiched between Snickers and Big Hunk, this complex formation has six distinct areas including the East Corner, The Chair, The Solarium, Abstract Roller Disco Block, a West Face, and a North Side. 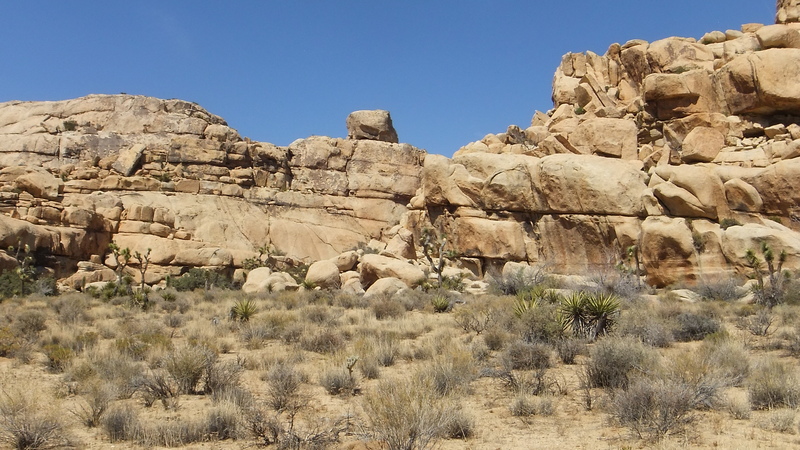 Subdividing the West Face is the Right Wall and a Left Wall. 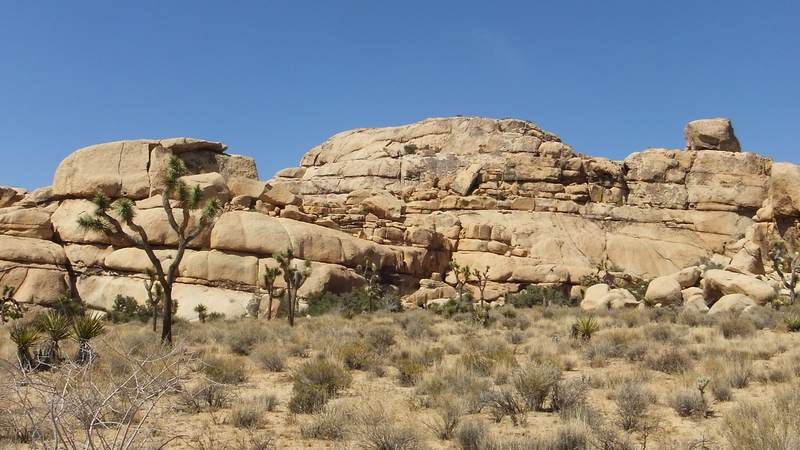 The Candy Bar’s northern and eastern sides are on the border of Piano Valley. 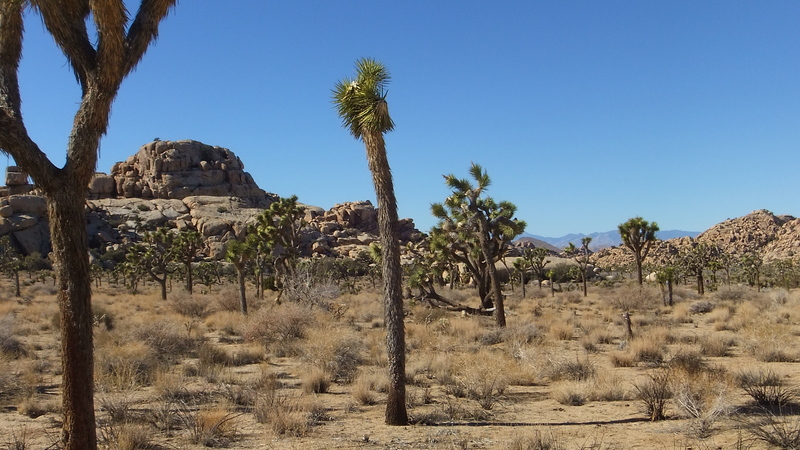 The north gets some afternoon sunshine but is often shaded. 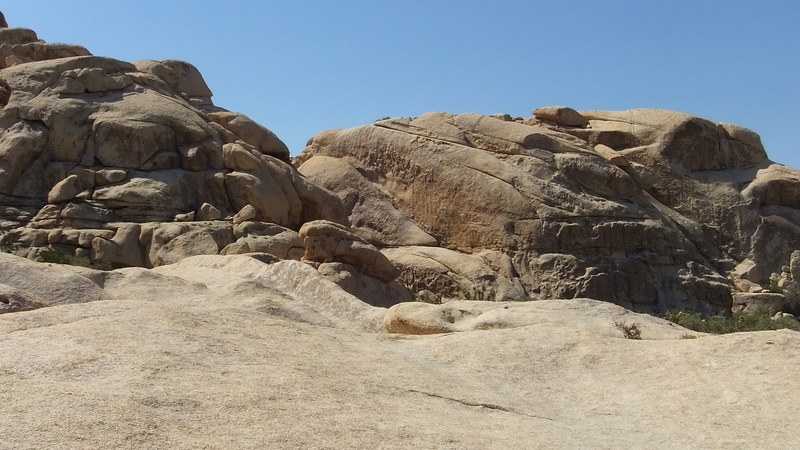 Most prominent are Little Hunk and Big Hunk. 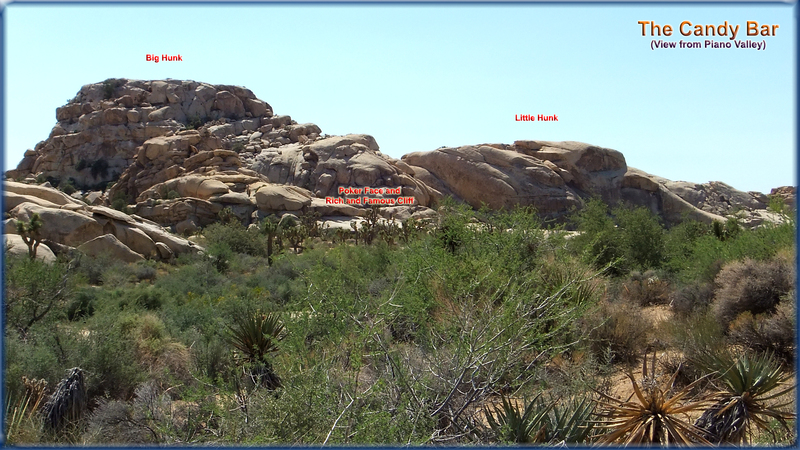 Between them, a narrow corridor gives access to The Shady Grove, part of Little Hunk and faces more or less northeast. 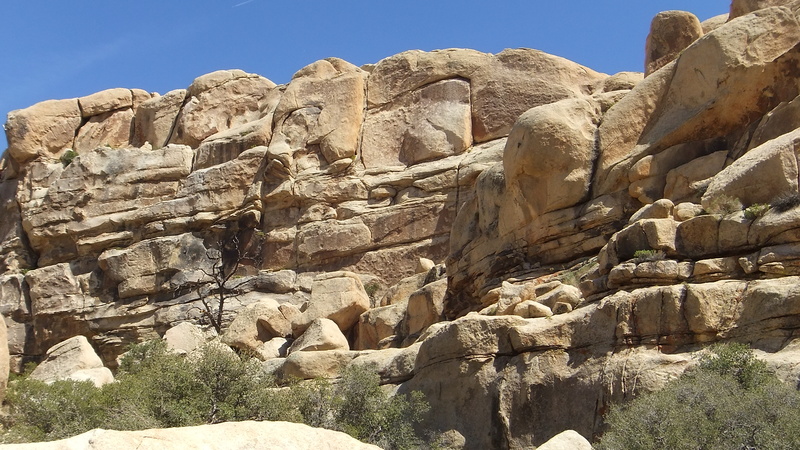 Along this side climbing has been restricted due to the discovery of Indian petroglyphs at the base of the wall. 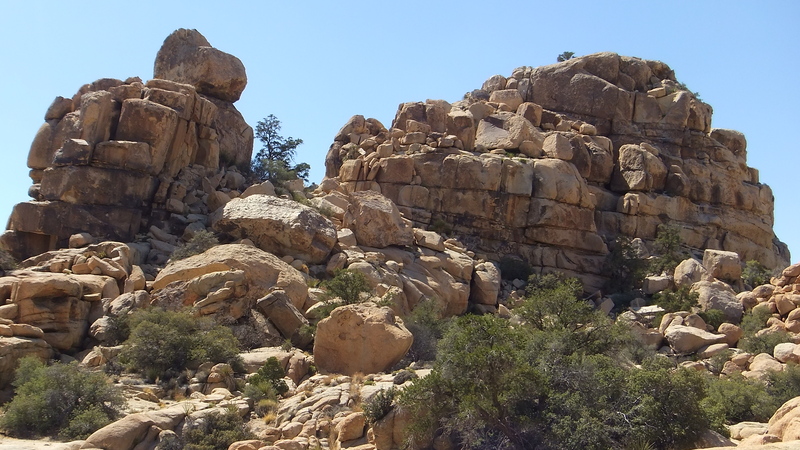 There are two small walls at the base of Big Hunk that are called Poker Face and Rich and Famous Cliff. 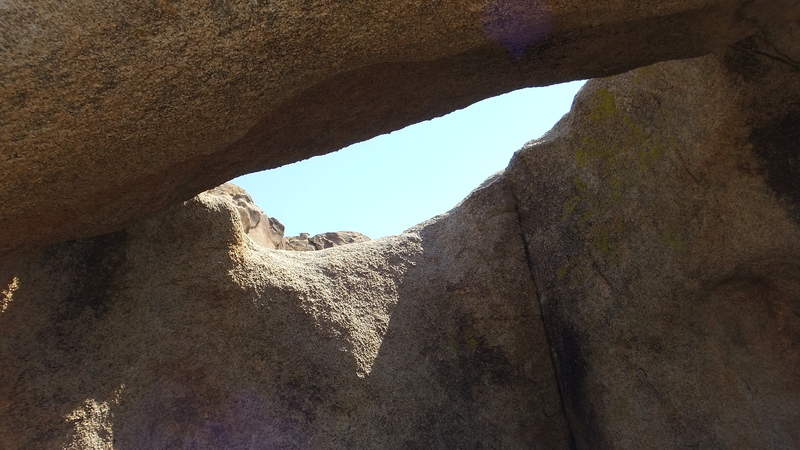 Also, I illustrate a small arch rock that I found between Mounds and The Solarium wall on Little Hunk. 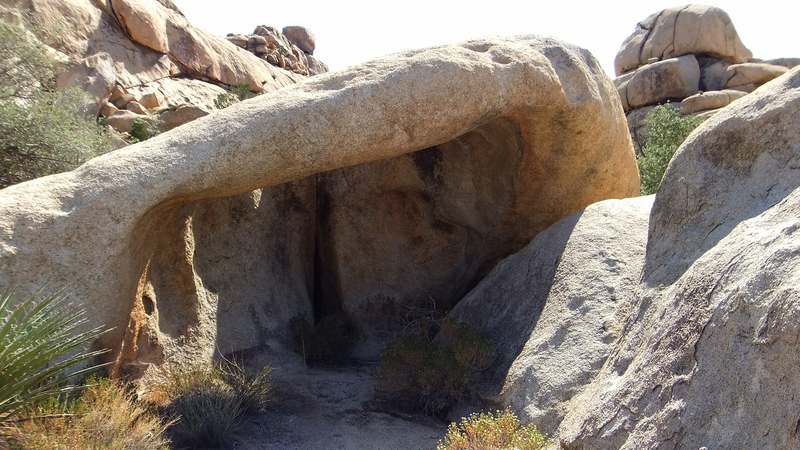 It has a large opening with a hole up top. 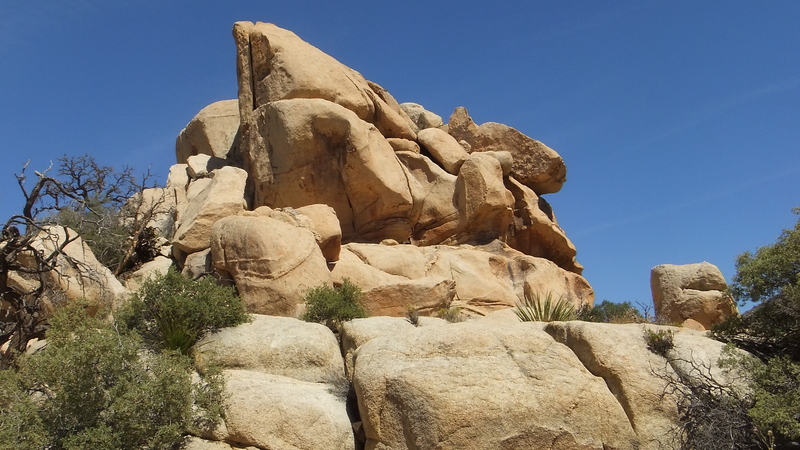 Though unlisted in the rock climbing guides, there is every reason to assume climbers have climbed and descended this small formation just for fun. 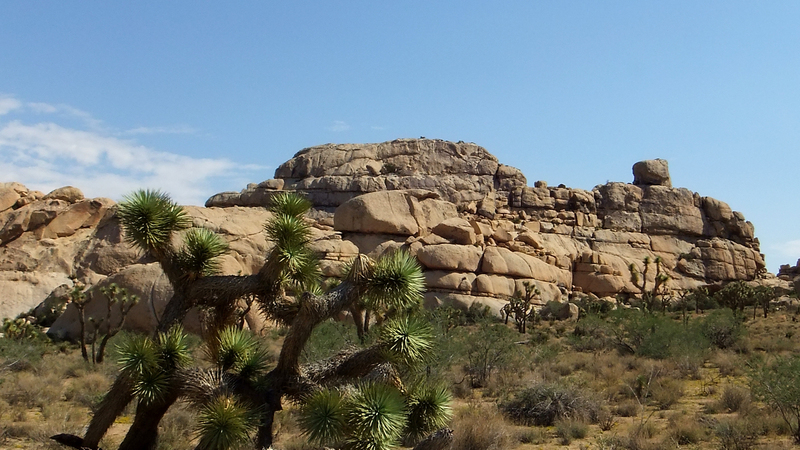 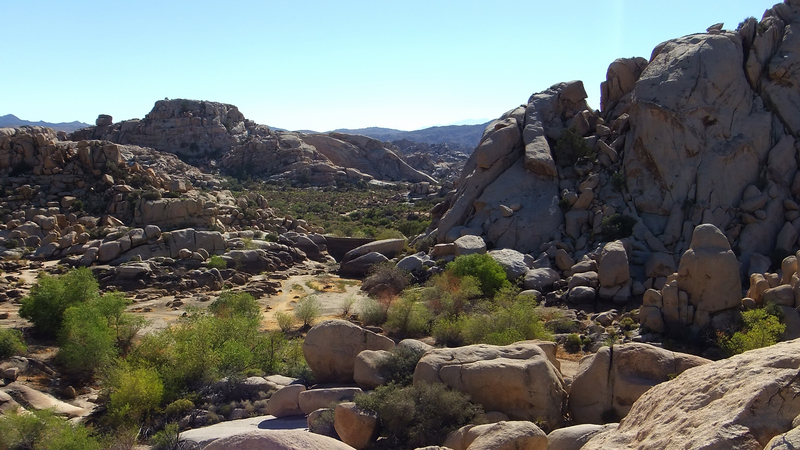 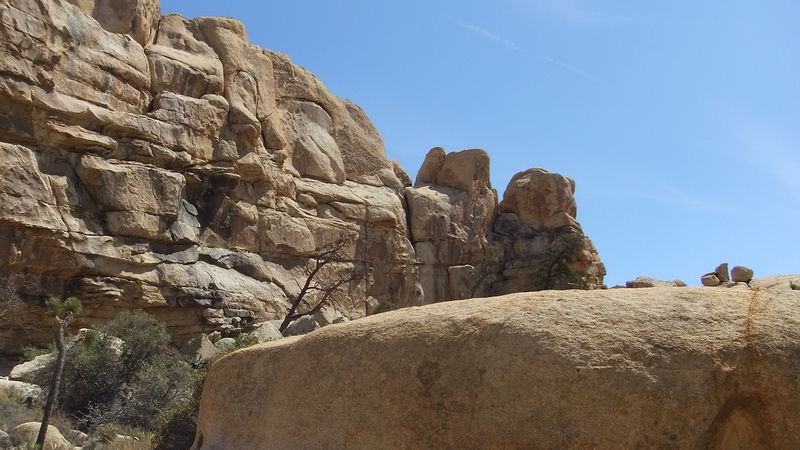 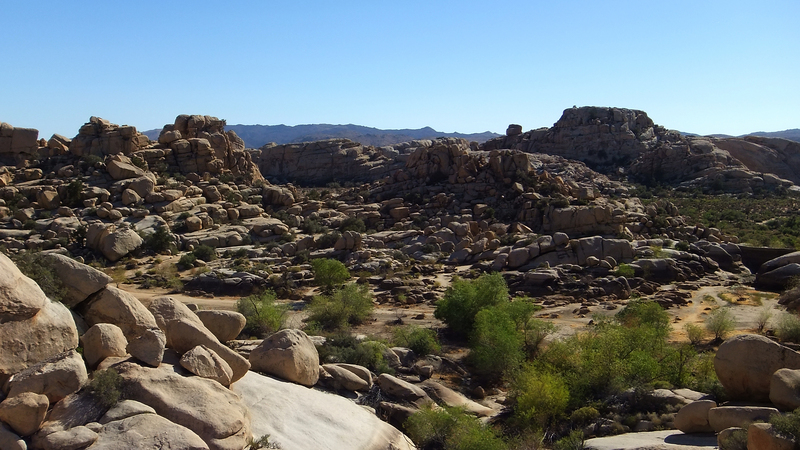 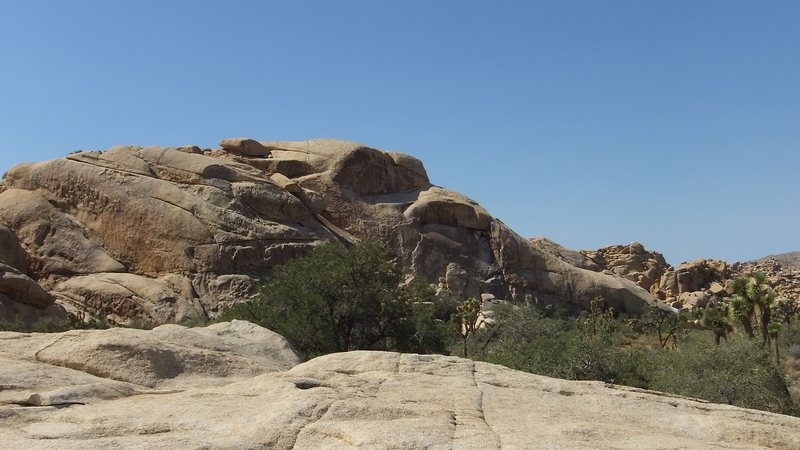 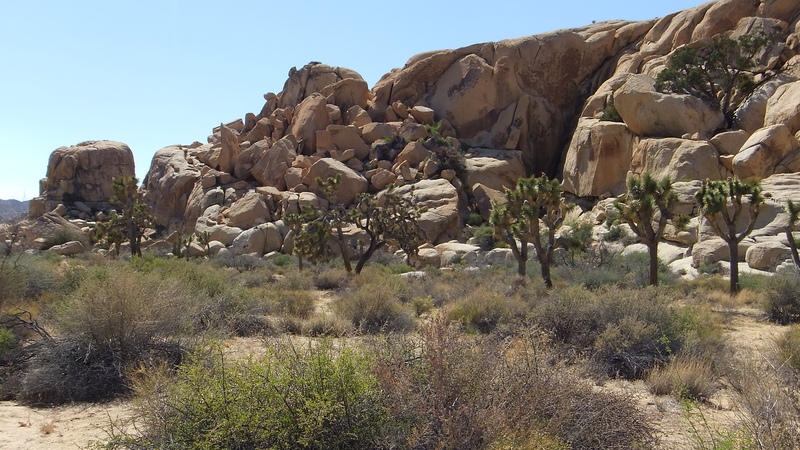 Barker Dam is one of Joshua Tree National Park’s premier destinations. 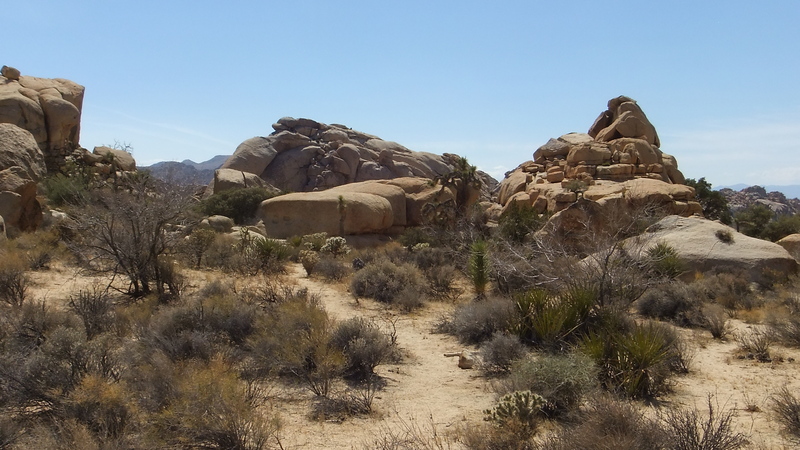 Many also complete the 1-mile loop hike, which passes through the eastern edge of Piano Valley. 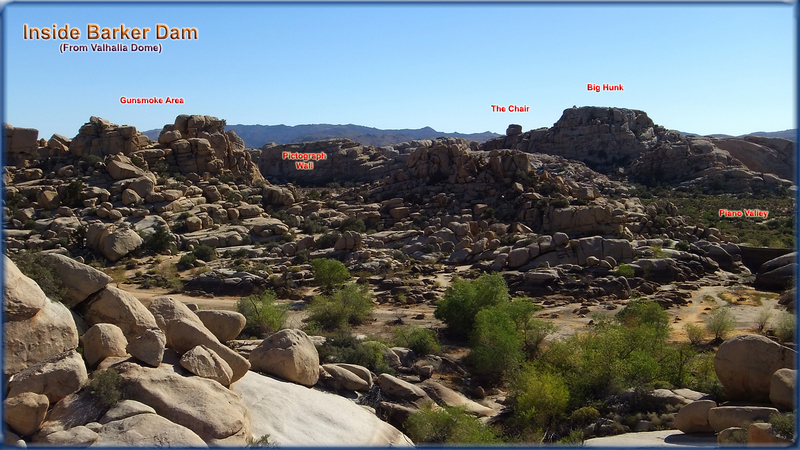 The Candy Bar formations line the west side and it is from here one can get outstanding medium-close shots of The Chair beside Big Hunk. 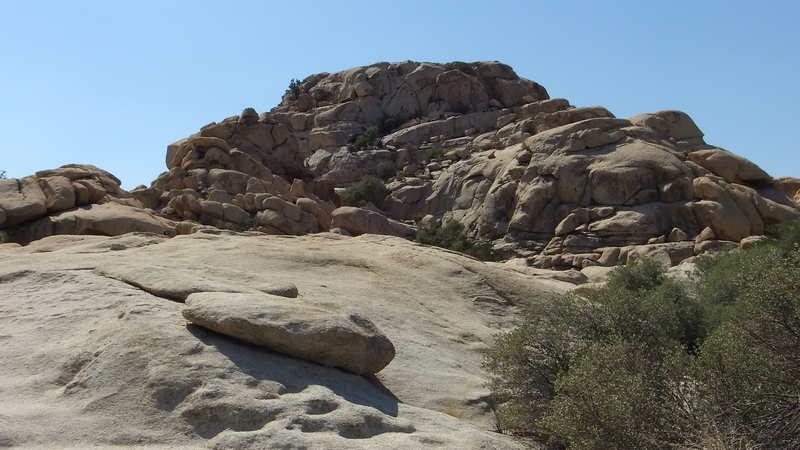 From this angle, The Chair does really look like its namesake. 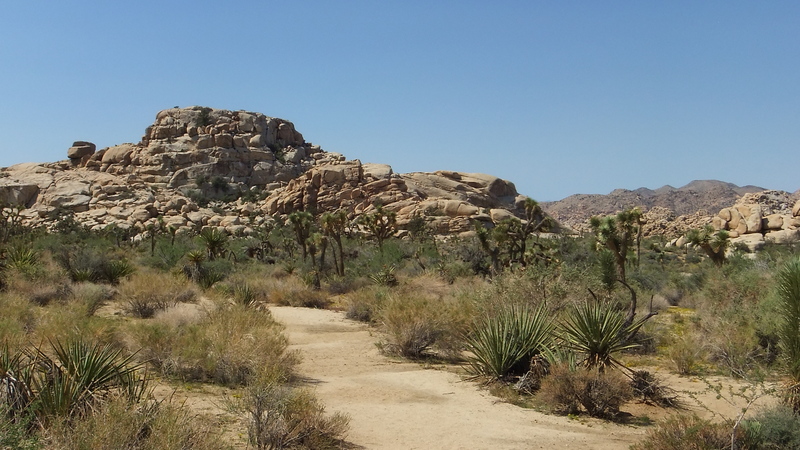 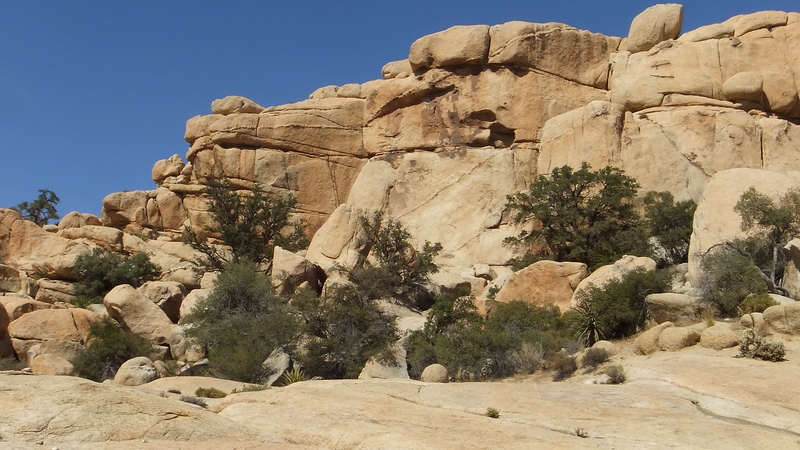 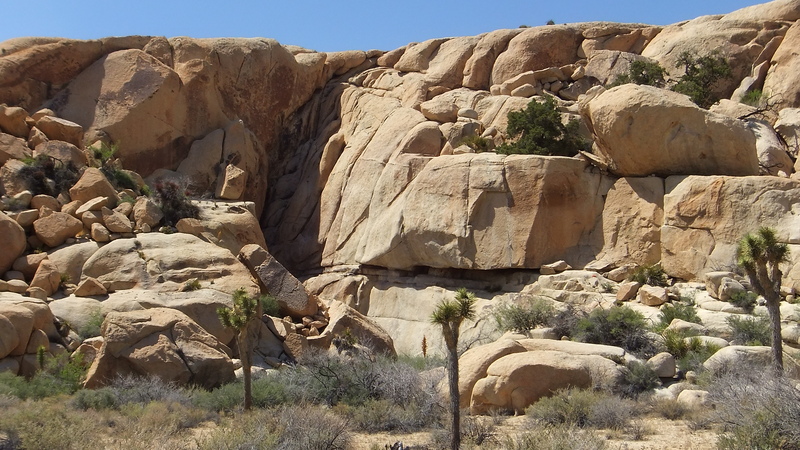 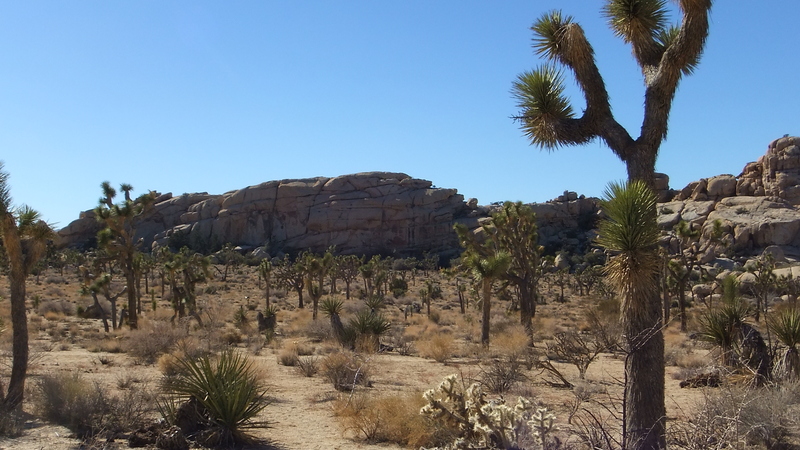 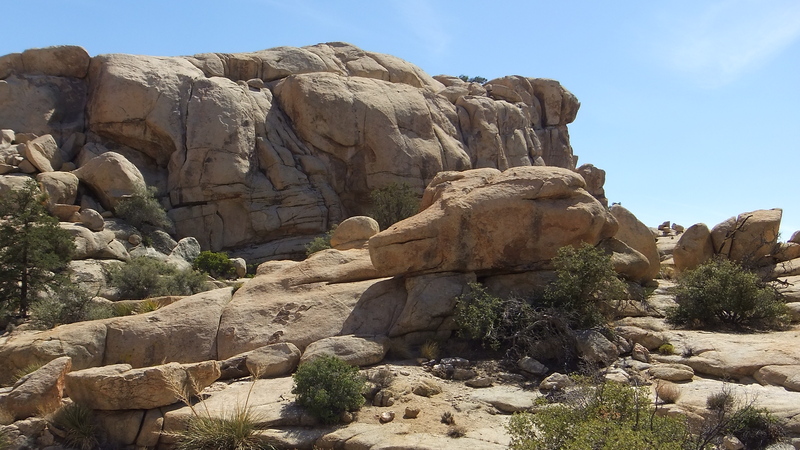 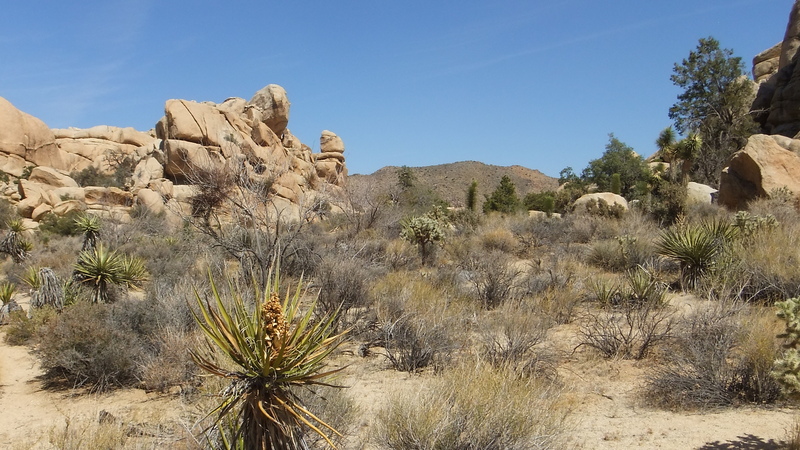 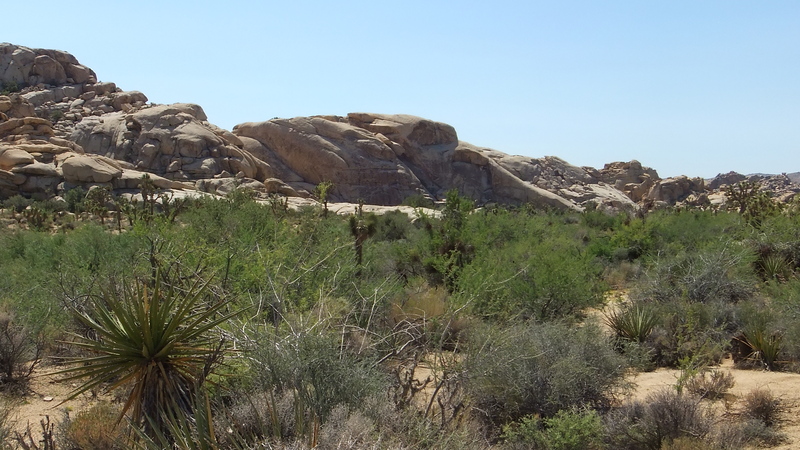 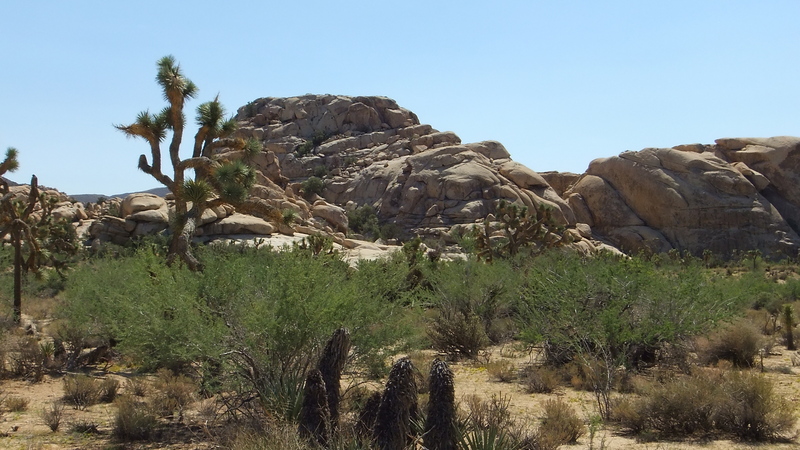 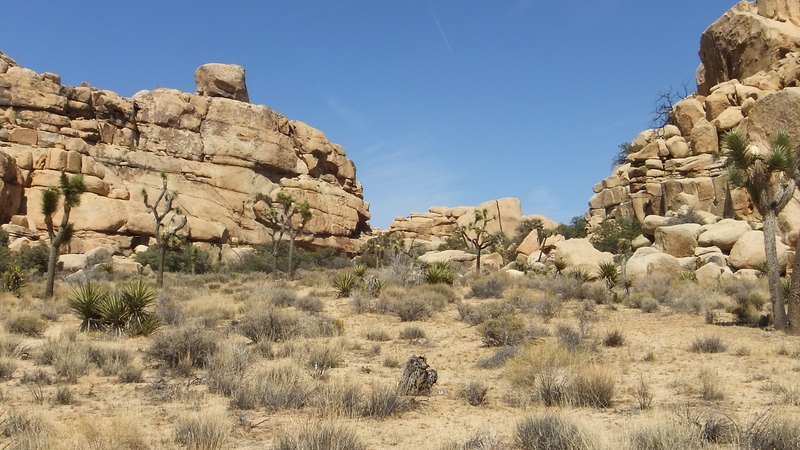 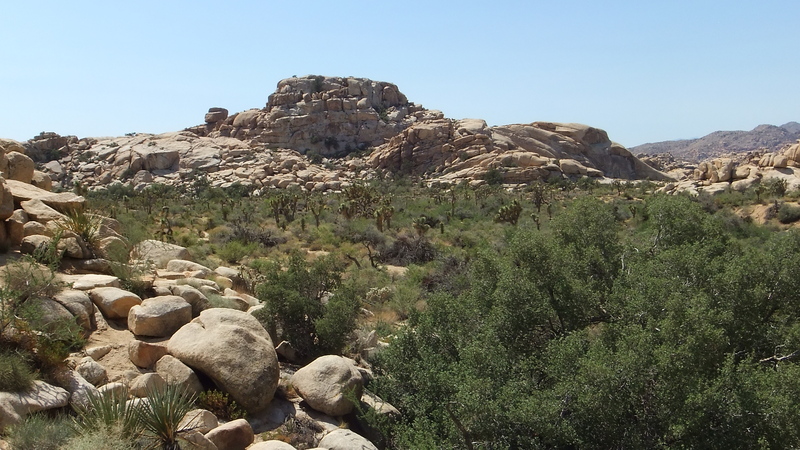 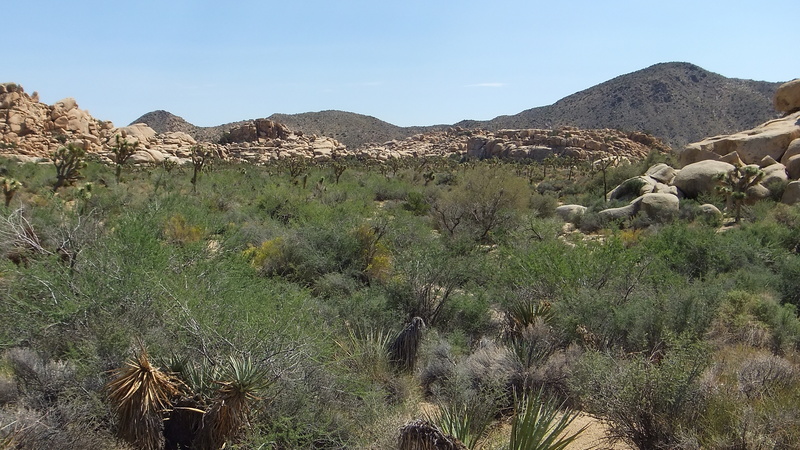 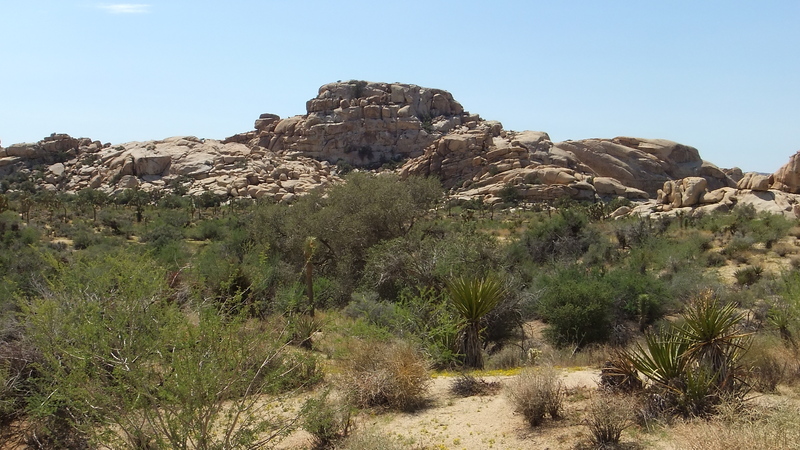 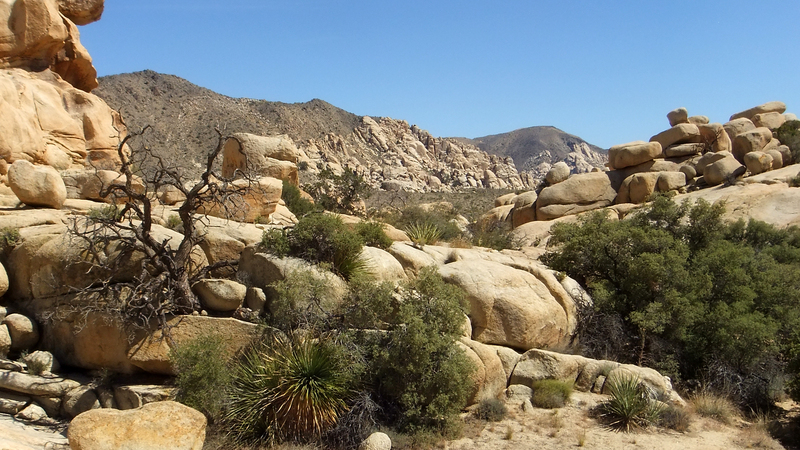 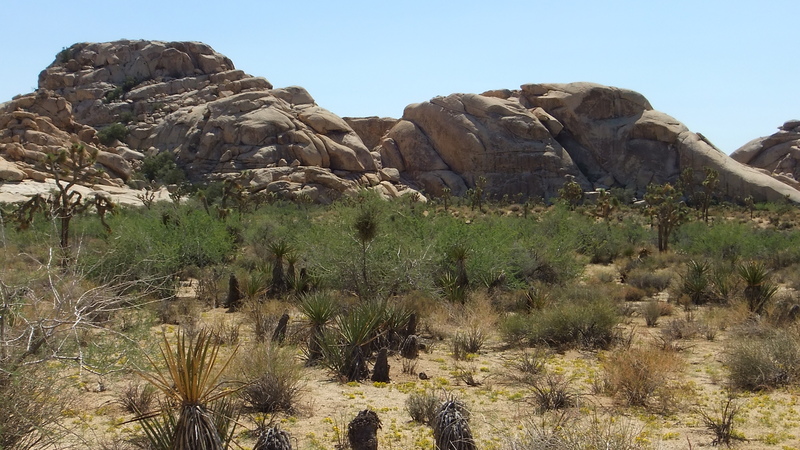 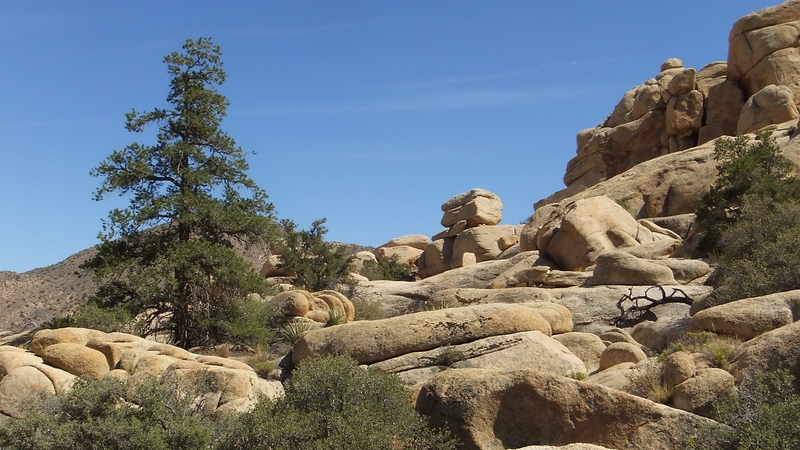 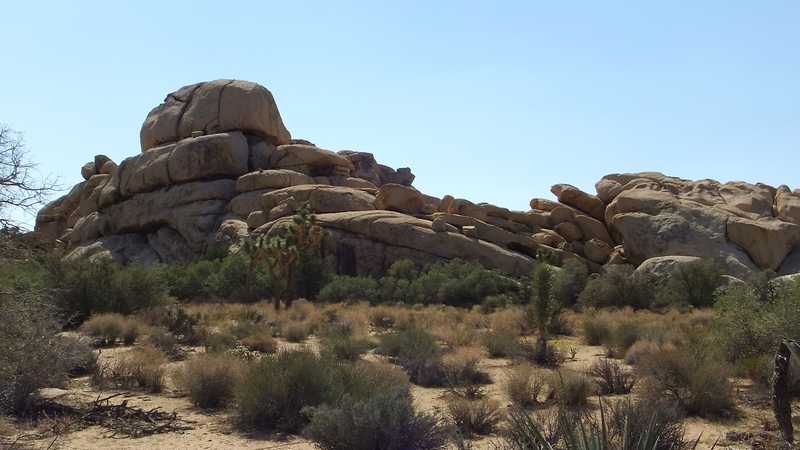 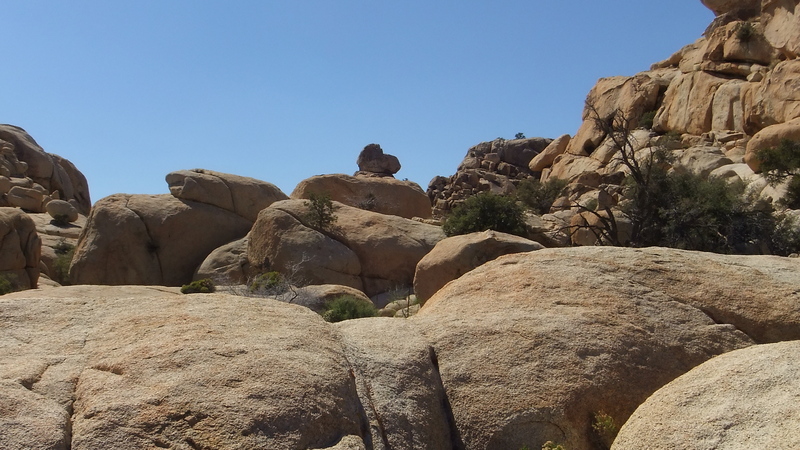 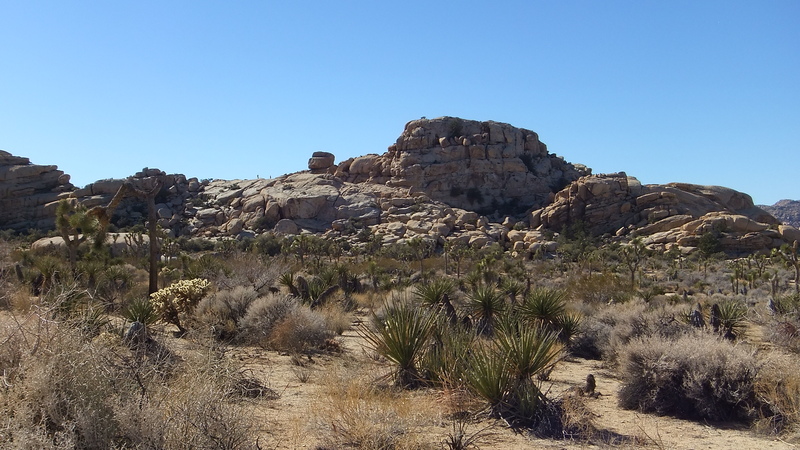 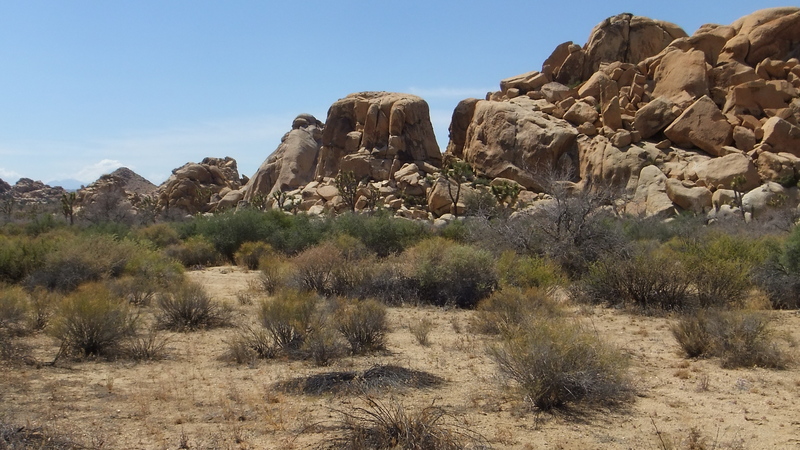 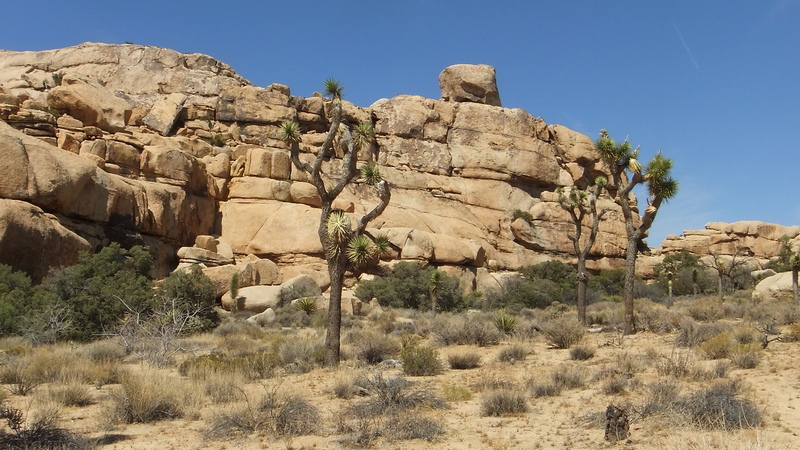 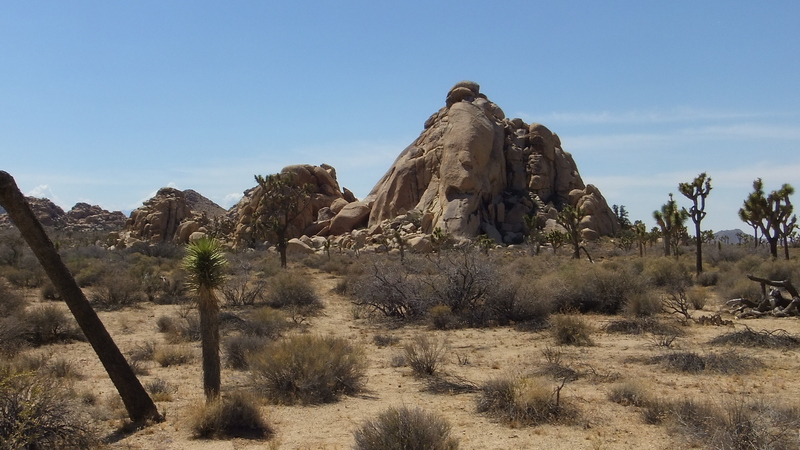 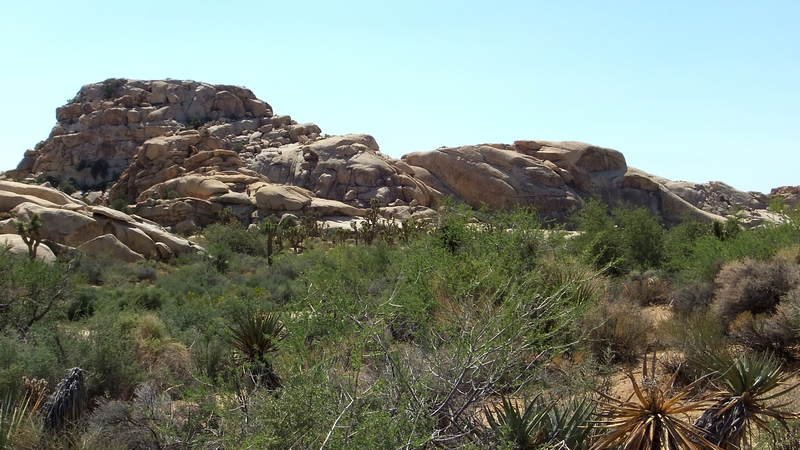 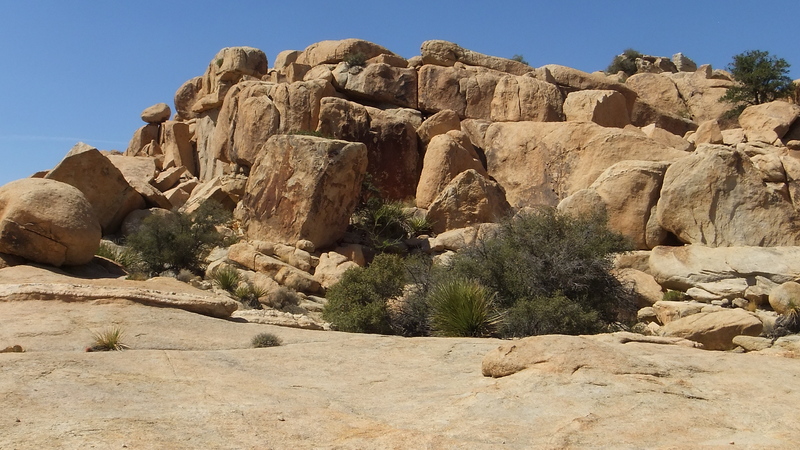 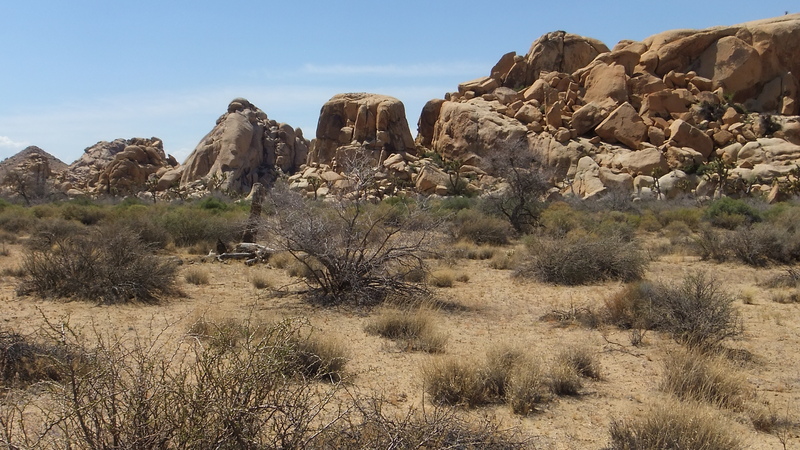 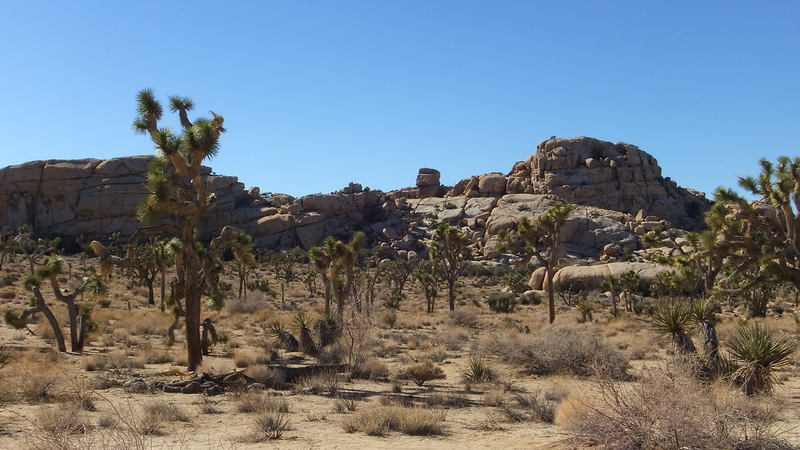 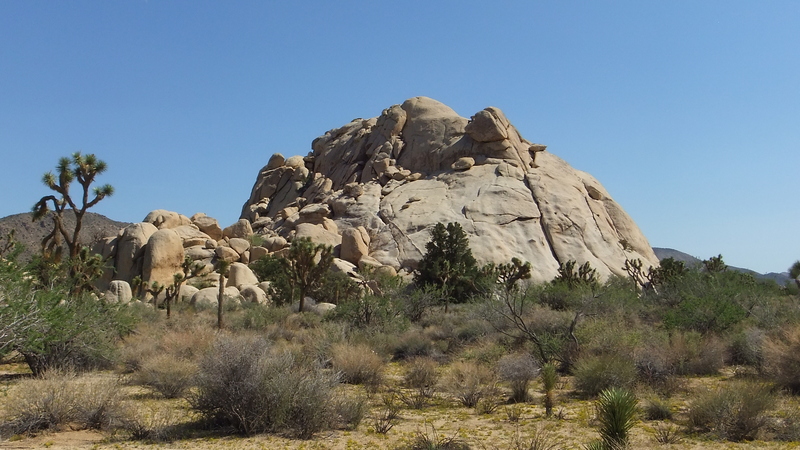 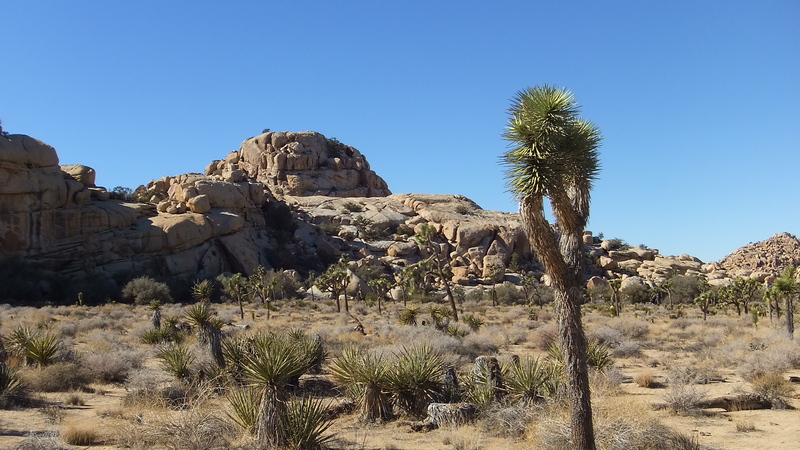 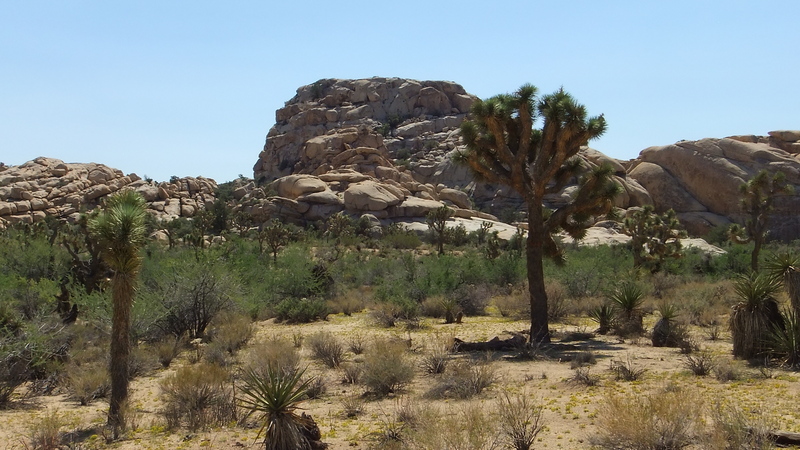 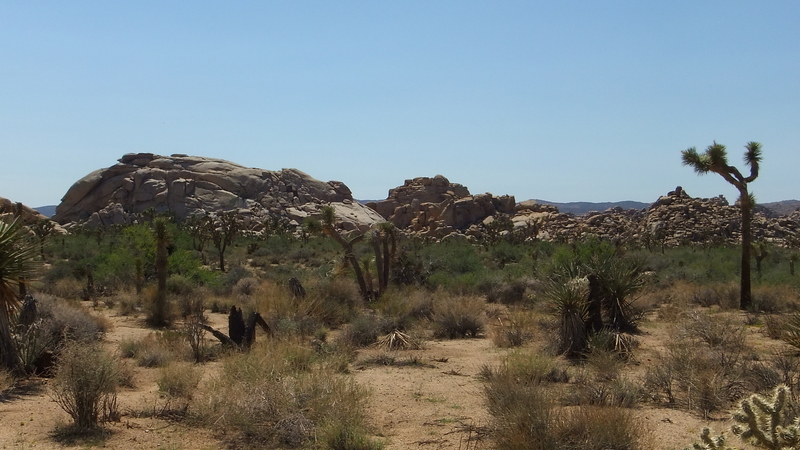 Piano Valley is named after the long, low-profile Piano Rock, a smooth flat-topped granite remnant that sits on the desert floor near Big Hunk. 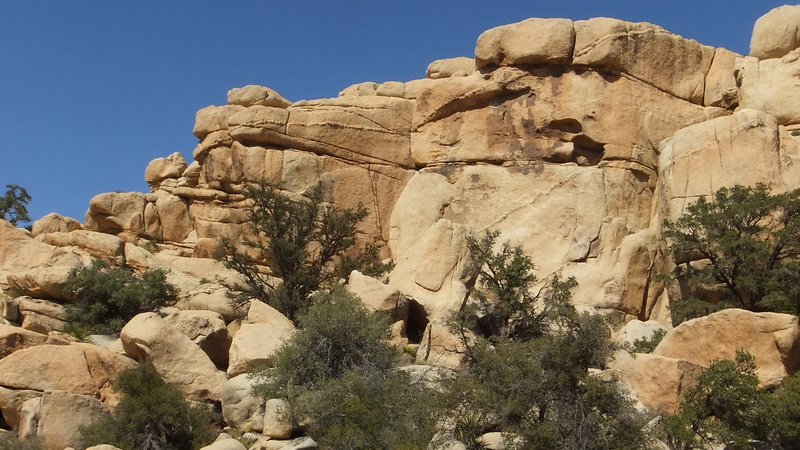 The Anasazi Wall is located on the West Face of Petroglyph Rock (The east side faces the Gunsmoke Traverse). It is my understanding that all of the rock climbs are on the side facing the Interior area of The Candy Bar. 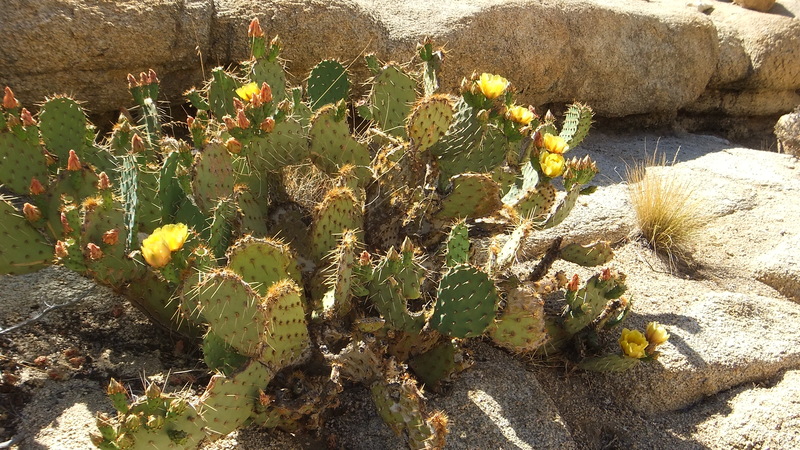 These are included in the next section Interior Corridor. 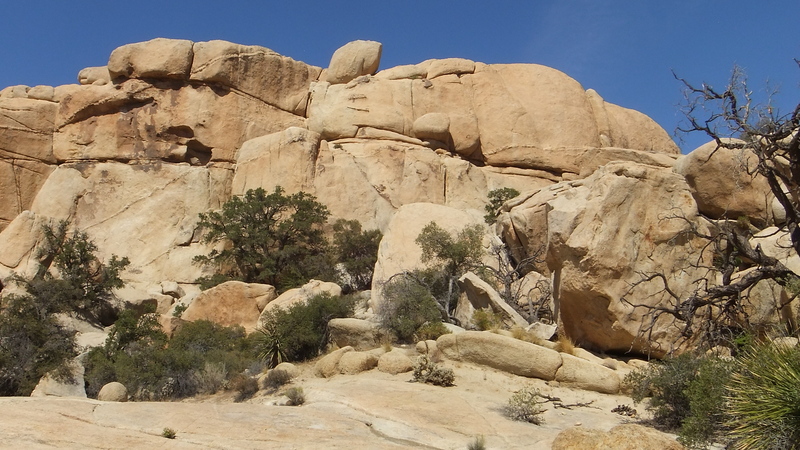 No climbing routes will be on the wall you see here. 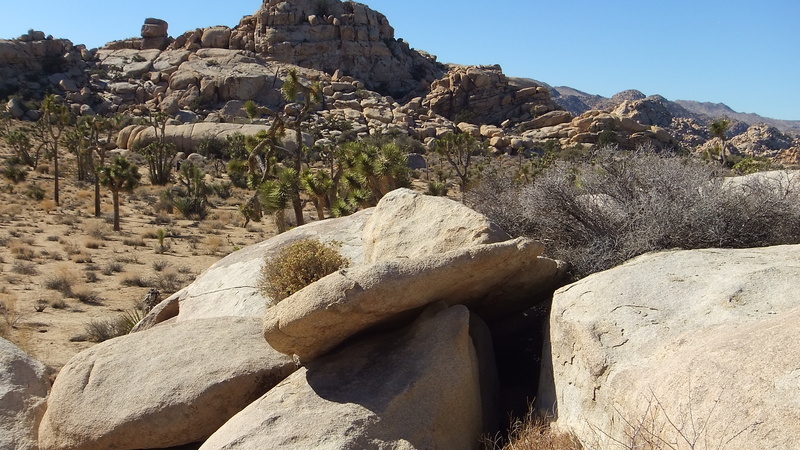 There is access to the interior of The Candy Bar between Snickers and Little Hunk (on the west side). 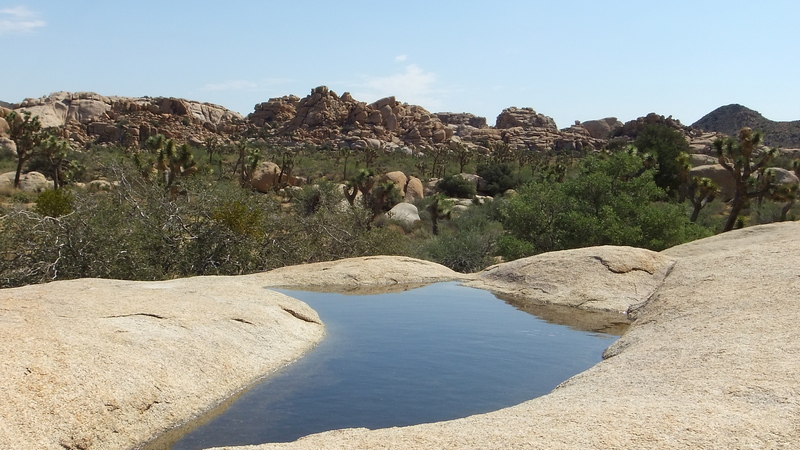 What a beautiful secret place away from the day-trippers occupying Hidden Valley Campground or beating a path to Barker Dam! 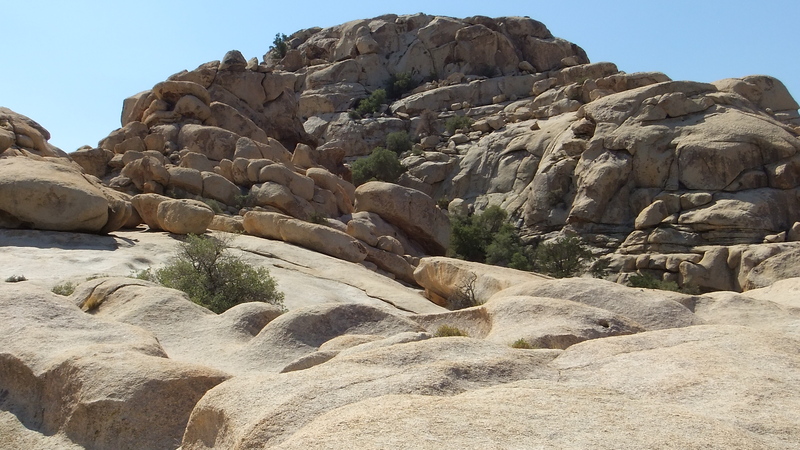 Few ever discover this Candy Bar interior—apart from inveterate rock climbers, that is. 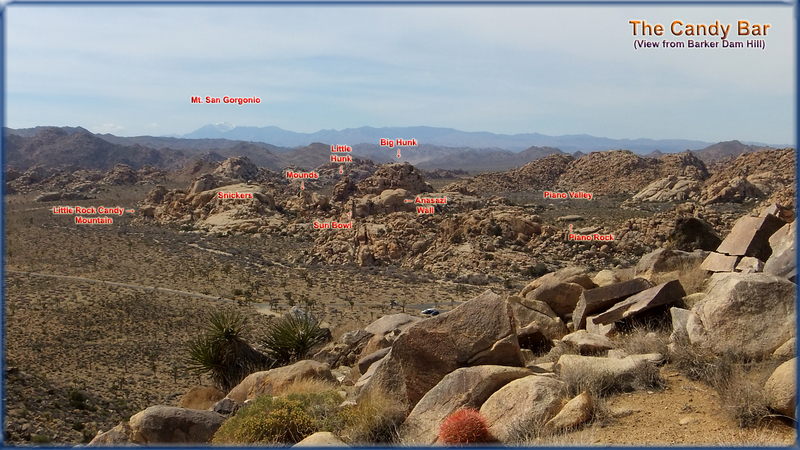 The Physical Graffiti route is most evident in the central, lighter rock face. 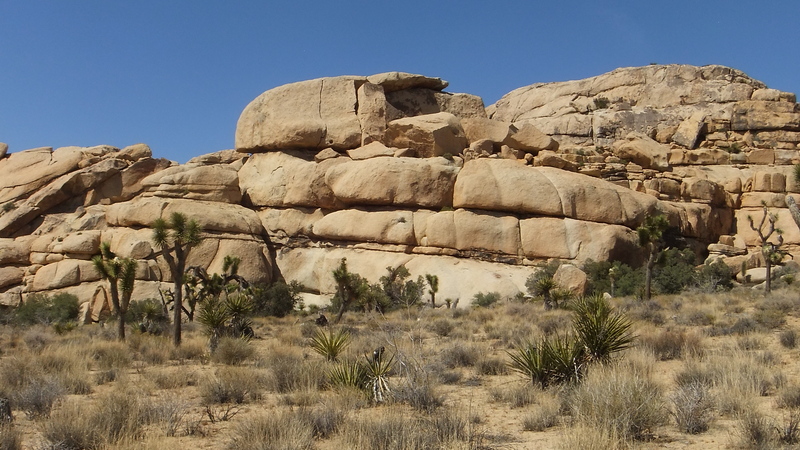 It climbs a right-slanting dike to a ledge, then makes a crazy horseshoe curve finishing back left on the overhang you see up top. 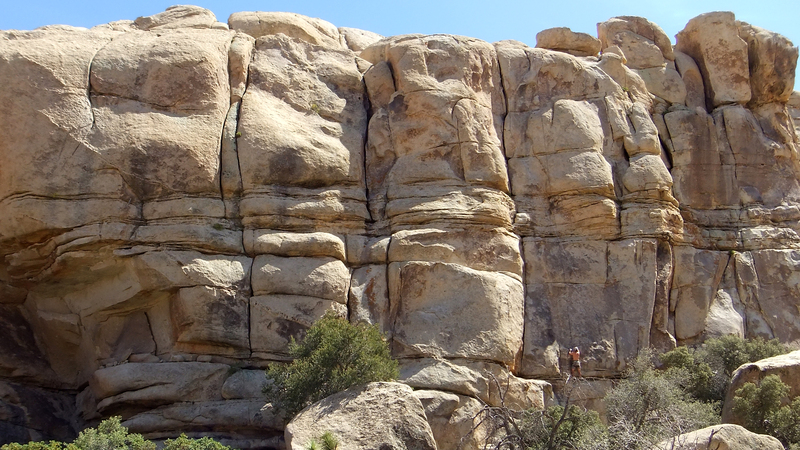 Only crazy people looking for 5.11a double-star jollies go for this 80ft challenge. 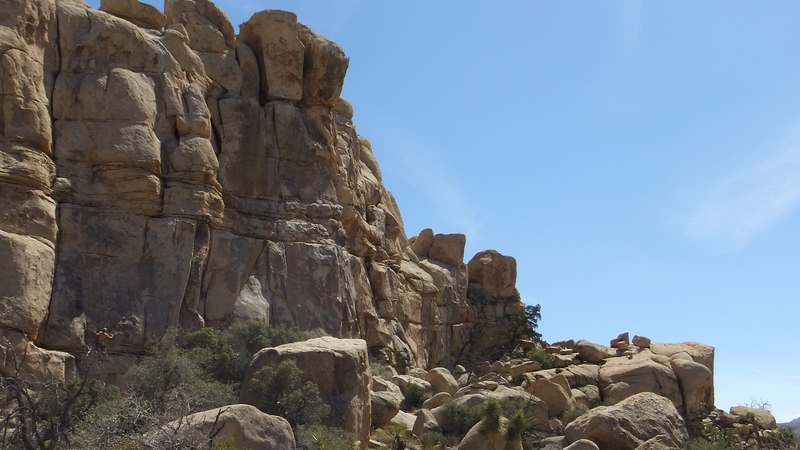 Miramontes advises, “May require two pitches due to rope drag, otherwise bring long slings.” Bummer! 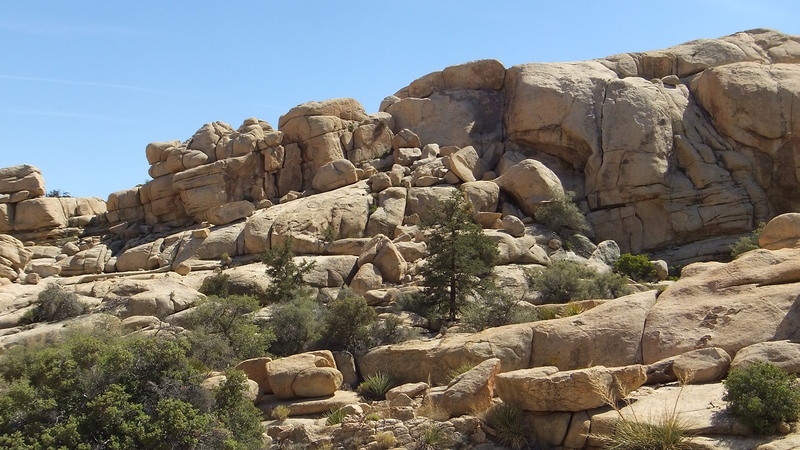 There is also a second, 50ft, route called Mushroom Crack. 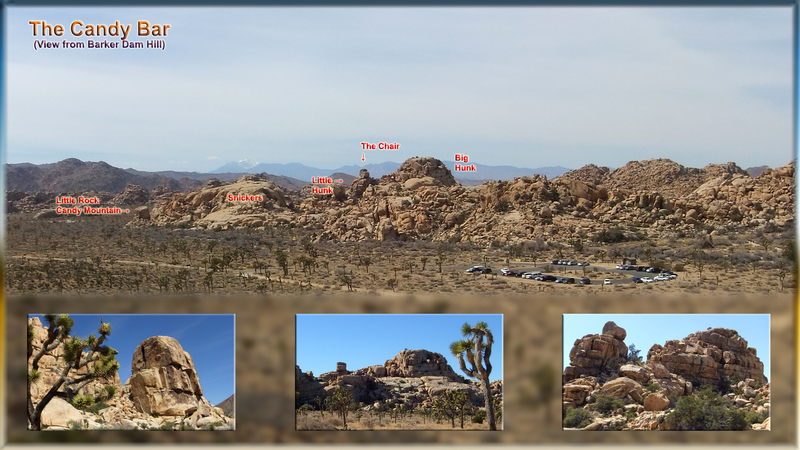 I hope that you enjoyed the 2D Galleries provided on this page, and will dig through your desk drawer for the red-cyan glasses to view the 3D pictures.